Giveaway over. Erin is the winner: I love the stir-chop thing for browning ground beef! 🙂 I sent you an email Erin. Holiday baking is about so much more than baking, it is about the memories. It is not about that perfect dessert or holiday, cookie it is about the time spent in the kitchen with family and friends. A few weeks ago I was asked to be part of The Pampered Chef’s Holiday Bake-Off and it was something I was excited to be part of. I love Pampered Chef and have been using their products for years and I love holiday baking and spending time in the kitchen with my family, so the combination was perfect. 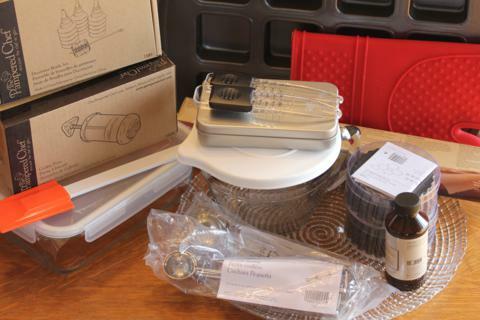 Last week I received a box of Pampered Chef products and I loved opening it to see what new and fun products they sent me. And my girls and I had so much fun putting the items to use this weekend as part of some holiday baking and cookie making. What did we make? 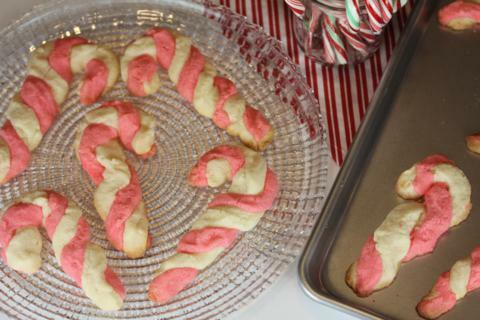 Candy Cane Sugar Cookies! These were so much fun to make and were perfect for the holidays. 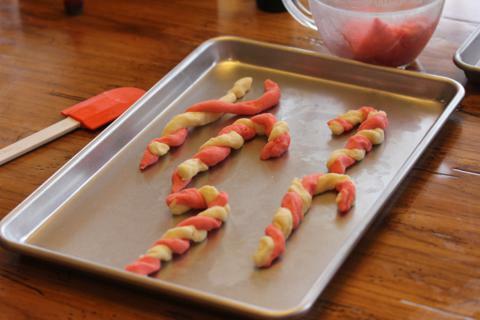 My girls and I made the dough and they had so much fun shaping the dough into candy cane shapes. The recipe below is for a gluten free sugar cookie dough that we used for these candy cane cookies, but I also put directions for using any basic sugar cookie dough. 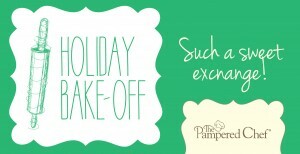 And make sure to check below the recipe for the fun giveaway from Pampered Chef! In a bowl cream butter, cream cheese, and sugar until light and fluffy. Add in rice flours, cornstarch, and xanthan gum and mix until combined. Chill dough for about 2 hours. Remove dough from refrigerator and divide dough in half. Place half of the dough into the small batter bowl. Add a few drops of red food coloring to one half of the dough and mix in until evenly mixed in. Using a small cookie scoop, take a small piece red dough and a small piece of regular dough and roll out them out into about 3 inch long ropes. Twist pieces together and curve into a candy cane shape. Place on a cookie sheet and bake at 350 for 10-12 minutes or until done. Divide the sugar cookie dough in half and place one half in the small batter bowl. Add a few drops of red food coloring and mix in until evenly mixed in. Using a cookie scoop take a small piece red dough and a small piece of regular dough and roll them out into about a 3 inch long ropes. Twist pieces together and curve into a candy cane shape. All you have to do to enter is leave me a comment, but if you have a favorite Pampered Chef product I would love to hear what it is. Giveaway will end Friday December 21, 2012 at noon CST. For more information please see my giveaway policy. If you are reading this through email you need to click through and leave a comment here to enter. Replying to this email will not count as an entry. Note: I was compensated for my time in writing this post and received free products, but my thoughts and opinions are my own. If you saw my kitchen, you could see how much I love Pampered Chef. Lynn, I love, love, love Pampered Chef. I think my favorite is the large and small scrapers, because you can scrape and cook with them. They are so versatile. Thanks for the give away and Merry Christmas. I love my stoneware bar pan from Pampered Chef. It is great for all sorts of breads, sandwiches, and things like baked fish. Love love love your ebooks and daily emails! I have a few pampered chef pieces I use almost daily. The rolling pun and the batter bowl with a lid. I can always use more pampered chef in my new kitchen! My favorite, most-used items are the stone scrapers. I love my pampered chef pizza stone. My favorite Pampered Chef item is the ice cream scoop! It’s amazing! I love my deep covered baker! I love the micro cooker!! I have had mine for YEARS… so long I can’t remember when I got it! I have always wanted some of their stonewear pans but I cant afford them. But I do have one of their adjustable measuring cups that I always use. Our family favorite would the round baking stone. We’ve had the same one for 13 years. My son has asked for one when he moves out. Their bamboo wooden spoons hold up for years! Great product. My most used Pampered Chef item is the Bamboo Toast Tongs, they get used every day! I love all my stoneware but my favorite tool is my chopper. My favorite would be the round baking stone. But I also have a 4 cup glass measuring cup/bowl that I use all the time. My favorite are the stones. I use them for all my cooking. My favorite Pampered Chef product is the food chopper! I like it so well, I have given a couple as Christmas and Bridal Shower gifts. I don’t have one yet, but my favorite product would be those microwave chip makers. I’d love to use them to make kale chips and sweet potatoes chips. I’ve been using the large measuring bowl for years now. I love Pampered Chef. There cookie sheets are one of my favorite products. I have lots of other products that I also love. I really like the zester and the stackable cooling rack…wonderful when baking lemon pound cake! I love the Deep Covered Baker aka “The Magic Pot” because it is almost magic how quickly you can get a meal together. The seasonings and sauces are really nice too. Thanks for the giveaway. My favorite Pampered Chef product is the pizza cutter. It is definitely the best one that I have ever used. Really enjoy reading your recipes. (Fav is baked pancakes). Will be trying the candy cane sugar cookies on Saturday. Thanks for the idea! I love PC. I am still using some products that I had when I was married 16 years ago! The stonewear pans and spatulas are my most used items! I love the spatulas and the vegetable peelers. Unfortunately I don’t own any Pampered Chef items but I am sure they are great products to have. I have heard good things about them. Love cooking my sauces with the pots!!! I love the baking stones. I would love to have the cookie press. Love my Pampered Chef products. I think I like my food chopper the best. I use it several times a week! 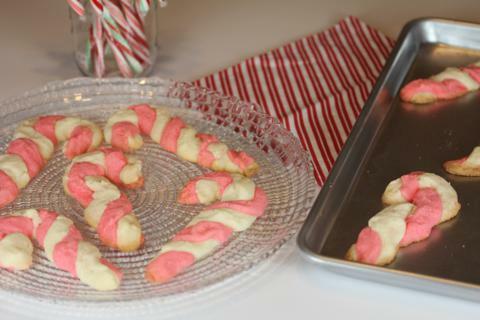 i made these same candy cane twist cookies with my mom ,allbeit a different recipe, along with tree and wreath shapes, every year. i always looked forward to repeating the tradition and spending extended time together. My favorite is the sandwich cutter. Mine fell apart so it is not easy to use but I love it..
My glass batter bowl is my go-to item, but I love all the PC products I have. I love Pampered Chef stoneware! I have a large pizza pan that is almost black and food just slips right off! I also like the small hand-held double rolling pin. I love trot skinny spatulas! I love my Pampered Chef items. My first thought is the can opener that does not leave sharp edges. I also love my Santoku knife like another reader. But one item I use all the time is the can drainer. It’s a handy tool often in the kitchen. My favorite pampered chef product is my stoneware. I use my pizza stones all the time! But I Love the whole line. Love the cooling rack!! It stands up to the heftiest items & doesn’t sag!!! So easy to clean too!!!! I have many favorite Pampered Chef Items..But right now its my small spreader. I have been making lots of cupcakes and it works great for frosting them & my stainless Mini Whisk…I could go on I have many of their items..
Oh, wow…Pampered Chef!!! I love absolutely everything I’ve ever purchased, but I’m particularly fond of the spices and spice combinations. It’s been a while now…my PC representative moved to MN! But I surely would love this giveaway since my bakeware has seen better days. Thanks for offering this. I think my favorite item from Pampered Chef would be the double strength Madascar vanilla extract. Everything I’ve tried from Pampered Chef works great, especially like the stoneware. Pampered Chef has so many wonderful tools, but my favorite and most used is the pan scraper! They work so well at scraping off all kinds of things! I love everything Pampered Chef, but I would have to say I use my stoneware and scrapers the most! I really enjoy all your recipes! I love the little rubber scrapper! I love Pampered Chef products. I couldn’t begin to choose a favorite. I love Pampered Chef, and my son and Daughter in-law love it even more! Great Christmas presents! I love your candy cane cookies, thanks for the recipe. Thanks also for offering this giveaway. I use my pampered chef cookie scoops all the time. They are wonderful! I would have to say my most used pampered chef item is my ice cream scoop, I have had it for years and it works great. My favorite thing is ironically one of their least expensive. I love the tiny spatula. We use it for everything. The first piece out of a baked goodie is no longer awful looking! How to pick a favorite PC product????? I love so many of them! The non-stick cookware is amazing as well as the white bowl scraper spoon thingy…..I forgot the name of it! But it curves around bowls and cans to scoop out every last bit of batter when baking and it can be used in pots when cooking on the stove as well! My pizza stone is my favorite Pampered Chef product. But I love many of their products. I love pampered chef products but cannot afford to buy them so I would love to win… My grand kids and I make cookies for Christmas every year!! I love my set of one cup glass bowls and lids! I use them every day! They are so handy. My other fav is the chopper. It is fast, easy to clean and works better than any on the market. I Love Pampered Chef, I have 2 favorite Items. The first is the bottle opener/can opener. I suffer from osteo-arthiritis and this little gadget is wonder for opening soda’s. The second item is the small black steamer. It is a wonderful item that I use at least twice a week. Makes wonder minute rice, and steamed broccoli. Love the Pampered Chef products. I just received the Quick Stir pitcher as a gift from a friend. I love pampered chep products, but don’t have any of these things. I have the stoneware bar pan, the food chopper, the can opener, and the madolin slicer. Pampered chef are good quality products. Would love to win! I love using my lemon juicer/keeper. Lately though, I’ve been using the whole lemon, so it’s not been getting as much use as when I first got it. Their stoneware is a favorite. Sadly ours are all gluten and have yet to be replaced. The only pampered chef item I have are the orange peelers. Love your blog and look forward to your emails. Thanks for the giveaway! My favorite Pampered Chef item is the large measuring cup/bowl with a lid – I don’t know it’s official name. I will be using it in just a few minutes to make cookies! Lynn, I love your newsletter. My favorite Pampered Chef item would have to be my Chef Knife. I use it almost every day when fixing meals. Please enter me to win! It is VERY hard to name only one Pampered Chef item I love, so I will name several. I love the garlic press, the small bar pan that fits perfectly in my toaster oven, the mix and chop, the bamboo spoons, and …. I have several pieces of Pampered Chef. I think my favorite is my stoneware cookie sheet. Love it for roasting vegetables. I love all my Pampered Chef stuff, just had more delivered today 🙂 I love the spatulas!!! I have trouble keeping time zones straight, so this might be too late, but I’ve got to try (just in case). I have one PC cookbook, and have used my sister’s pizza stone (love it! ).